HologramUSA is looking to create 3D representations of America’s most famous entertainers, but the company is also looking to enter the ring of American politics. The Washington Post states that HologramUSA has announced the hiring of Northen Virginia-based firm U.S. Government Relations International, or USGRI. USGRI is working convince potential customers to consider using the technology as a new communication tool. The goal is to get politicians, corporate heads, government officials and others of that ilk to use the technology, which can be broadcast across the U.S. The technology could open up new avenues in the political campaigning process. “A general or a politician or a head of corporate can project themselves physically in a life-size projection that is completely believable at a matter of a few feet,” said Alki David, head of Hologram USA. American politicians have yet to use the technology, but in India, the technology is already being put to use. Narendra Modi used 3D imagery in his successful campaign for the seat of Prime Minister. 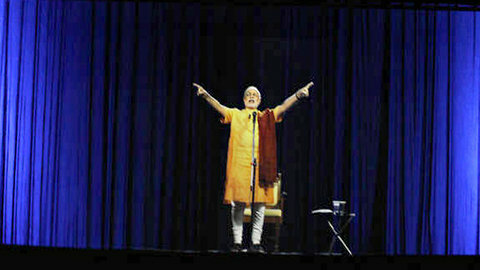 With HologramUSA, Modi was able to appear live in hologram form via satellite at rallies.